Last week was full of celebrations with Canada Day and Independence Day in the United States. With all the fireworks out of the way, the following are some social media updates you may have missed. Facebook Updates Pages App: Facebook has made several updates to it’s Page Manager App to make Page management easier than ever. The newest updates make it possible to share posts, include a photo in comments, tag other Facebook pages in comments, and add location information to posts. To access these new features, Facebook Page Managers simply need to update their existing Facebook Page Manager App. Facebook Adds Ad Management Shortcut: Facebook Page Managers now have easy access to current ad campaigns through a newly added shortcut visible upon sign-in. The ad shortcut provides quick access to manage and monitor campaigns for Pages and apps. The shortcut appears on the upper-right navigation area after signing into your personal Facebook account. 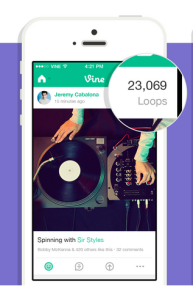 Vine Introduces Loop Counts: Vine launched loop counts at the start of the month for iOS, Android, and the web. Loop counts represent how many times viewers have watched and re-watched a Vine. In addition to likes and re-Vines, Loop counts are another indicator of a Vine’s popularity.